I was involved when PAMIS was first established. I met Loretto Lambe the cofounder of PAMIS in my role as an occupational therapist working in the services for people with learning disabilities just after she moved up here. I then got involved in the very first workshop that PAMIS developed for family carers - moving and handling – and then that was it I remained involved! When I took up a post at NHS Education for Scotland my involvement as a practitioner stopped but they asked me to become a Board member – and I did. Because I had been involved with PAMIS over the years I was aware of what an amazing and committed organisation it was. I was inspired and had learnt so much about engagement, partnership working and being creative so when an opportunity to apply for the post here came up I grabbed it! People with profound and multiple learning disabilities are inspirational and some of our best educators and having learnt so much from them, from their families and from PAMIS itself I knew that working here would be a continuous learning curve but full of doing things that really matter and can have an impact. I am an occupational therapist and in the past worked with people with PMLD so this gives me a really good understanding of how to provide inclusive, meaningful activity and occupation and how to support communities to be inclusive. 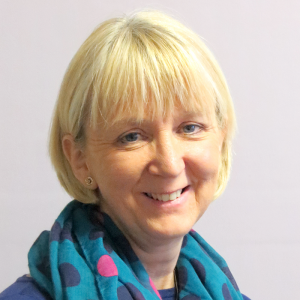 I have spent most of my career supporting the education and development of others and my last role at NHS Education for Scotland I was the lead for practice education for the allied health professions. I am passionate about education and support for our current and next generation of health and social care practitioners and I know that people with PMLD can teach them and us how to care, how to act with compassion and how to work as a team – absolutely core to all of our learning. I have been a senior leader in health and also worked on national and Scottish government projects. I enjoy developing policy and strategy and love supporting good policy into practice. It means I can’t wait to get out of bed to get into work! Sometimes it means I don’t want to go home because I am involved in such interesting and life changing work. It means I get to work with an amazing team of staff and governors and other fantastic organisations. It also means I am privileged to work and spend time with inspirational family carers and people with PMLD. It means I never stop learning, can’t stop thinking of new things to develop but might be able to stop if I didn’t drink coffee! Above all it means I get to do the things that can make a difference – work here is so much more than a job. PAMIS has some amazing resources that can really make a difference to some of the most excluded people in our communities. People don’t want to exclude they just don’t always know how to include people with a profound and multiple learning disability and PAMIS can support them to learn how to. The biggest barrier for people with PMLD and their family carers is the lack of changing places toilets – such a basic need but without PAMIS this will often be forgotten in the planning and development of services, buildings and communities. When people know about PAMIS they certainly know about changing places toilets! Many family carers are caring 24/7 and can be really isolated. They also face huge caring challenges – PAMIS can support them, can provide social contact and creative solutions to some of their caring issues. PAMIS cares, PAMIS campaigns and PAMIS is supporting a change in culture so everyone is included and communities experience the inspiration of people with PMLD.